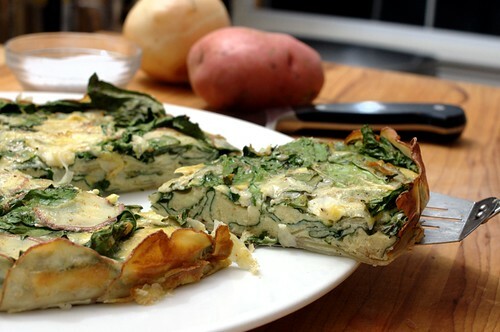 roasted garlic and spinach frittata with a red potato crust, originally uploaded by aarn! +28th June, 2010+. whipped six eggs until foamy with 4-cloves of crushed roasted garlic, 1.5T. white miso paste, 2T. heavy cream, a splash of olive oil, a pinch of cayenne, 2T. breadcrumbs, salt, pepper, and three sprigs worth of picked fresh thyme. then removed from the pan using a flexible spatula. Looks incredible can't wait to try this out! made this last night, turned out great and was awesome cold the next day for breakfast! hey, thanks all. glad that the recipe worked out. I have made this recipe a total of 3 times, since reading your post. I love, loved and still love it. I has been looking through your past post to get more great ideas. Thanks for sharing. I also Love your name, hehehehe.